Region: This bug can be found in the western United States, with similar species throughout North America. Life cycle: This insect produces several generations each year. The adult Stink Bug hibernates in garden rubbish. 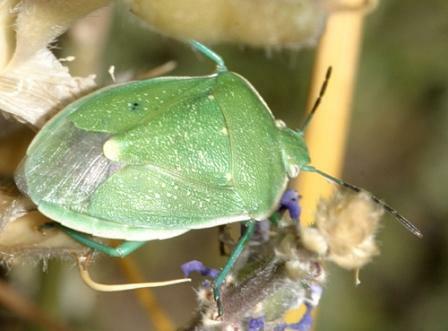 Physical Description: This 1/2 inch long bug is bright green with three orange marks at the top of the back and a white dot at the tip of the abdomen. The eggs are a pale green or brown and are laid in groups on the leaves of host plants. Feeding characteristics: This pest can be found on asparagus, bean, pea, and potato plants. There feeding can cause pods to become pimpled and shoot to wilt. Controls: Control measures are seldom necessary, but in emergencies dust with sabadilla.